Are you worried about hair loss and want to treat it? Then you can try coconut oil. Coconut oil is excellent for your hair and helps in preventing all problems of hair. So, if you have not tried coconut oil, it is time that you buy coconut oil and start applying on your hair. Coconut oil is not as expensive as the various hair care products that you get in the market, but it is more effective than any other products that you get in the market. Coconut is the first plant that was ever used to get its oil and used by human beings. This oil is extracted only from the mature fruits of the coconut tree. You can easily identify pure coconut oil as it is white in color, thick and semi solid. Dermatologists advise that you have to use only pure and refined virgin coconut oil on your hair and scalp. This will provide you the best results. Those who live in coastal areas use coconut oil as coconut trees are in plenty on such areas. This helps in providing them strong and healthy hair that is thick and beautiful. 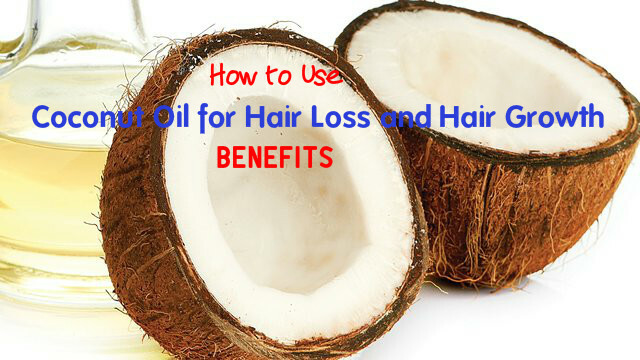 How to use Coconut Oil for Hair Loss? Take some coconut oil in a small bowl and warm it. Make sure that you do not overheat it. Apply this warm oil on your scalp using your finger tips. Massage your scalp for a while. This is very beneficial for improving blood circulation in the scalp. Now you have to take a comb and comb your hair gently, so that each strand of your hair gets the oil. Leave it on your hair overnight and then you can wash your hair with a mild herbal shampoo next morning. If you cannot leave it overnight, wait for at least 30 minutes to one hour and then you can wash your hair. Do this at least 3 times a week and see how well your hair grows. Is Coconut Oil Good for Hair Loss Treatment? Prevents viral and bacterial infections: Coconut oil has anti-bacterial and anti-viral properties, which help in protecting your scalp from various infections caused by bacteria and virus. The nutrients ion this oil keep your hair and scalp well nourished and healthy, preventing hair fall. Prevents hydral fatigue: When there is water retention or absorption of water by hair fibers, you hair gets damaged due to swelling or shrinking. This is known as hydral fatigue and this can cause falling of hair. By using coconut oil you can prevent this problem and this leads to a reduction in hair fall. Prevents protein loss from hair: When there is a loss of protein, hair fall can occur. This can give you weak and unhealthy hair that easily falls off. Applying coconut oil on hair and scalp is said to prevent loss of protein from damaged or undamaged hair. This way it helps in preventing hair loss. Strengthens hair roots: Every strand of hair is like a tube, which is hollow inside. When you apply coconut oil on your scalp and hair, this oil penetrated deep inside. This fills the hair shafts and thus provides more volume to your hair. With regular application of this oil, the roots of your hair become stronger and this helps in preventing hair fall. You will also get fuller and denser hair. Seals in the moisture: Coconut oil helps in locking the moisture that is essential for your hair. Applying coconut oil is an easy way to keep your hair well hydrated, soft and silky. It conditions you hair from its root to the tips and offers protection to your hair from the heat and other environmental damages. It penetrates deep within the follicles of your hair and helps in stimulating hair growth. It has the power to fight against the bacteria and virus that may attack your scalp. This way it keeps your scalp healthy and free from any infections. It is also good for getting rid of lice and dandruff and provides you relief from insect bites. It has hydrating properties and so is great for keeping your hair moisturized. So, if you have dry and brittle hair that is dull and lifeless, apply coconut oil and it will make it healthy and shining. Coconut oil is makes your hair look soft and shiny. It slows down hair loss and gradually makes your hair grow properly. Coconut oil is excellent for preventing split ends and to prevent breakage of hair strands. Many women, who have been using coconut oil for long, have revealed the secret behind their black hair. They have vouched that the reason why their hair is not turning grey too soon is the use of this oil. How to Make Pure Coconut Oil at Home? Heat 4 cups of water till steams starts coming up. Now take 2 mature and brown coconuts and scrape them. Put the grated coconut in a blender and blend well by adding some hot water to it. Strain it with the help of cheesecloth. Squeeze the cloth to get the all the liquid. Now you can blend the pulp again with some hot water so that you extract all the liquid form the grated coconut. Now boil this in a saucepan on medium to high flame. Stir continuously till all the water has evaporated and the cream has separated from the oil. When the cream turns brown in color, you can remove it from flame and your coconut oil is ready. It takes about 1 hour of boiling to get oil this way. If you prefer not to boil, you can leave it at room temperature for 24 hours and then put it in the refrigerator. The oil will solidify and you can remove it easily. What are the Benefits of Trimming Your Split Ends?